Thank you for choosing accusonus ERA Noise Remover. In order to better understand the main concepts and operation of ERA Noise Remover, please take the time to read this user manual. You can also check out the FAQ or blog section of our site for educational content and follow us on Facebook and YouTube for tips & tutorials. 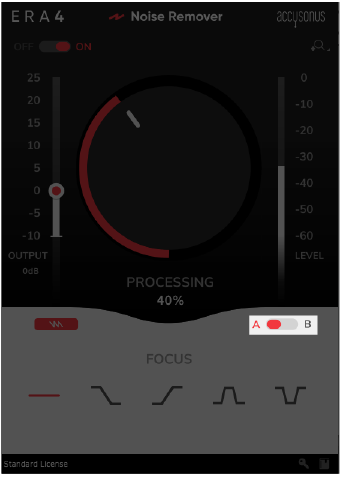 ERA Noise Remover is an one-knob audio effect plug-in that offers precision-grade denoising and automatic audio repair functionality without compromising audio quality. Based on the multi-patented accusonus noise suppression algorithms, ERA Noise Remover simply works and allows for efficient removal of the most common noise sources. You can find the latest ERA Noiser Remover installer in your accusonus "My Account" page, in the “Downloads” section (http://accusonus.com/dashboard ). For more information about installation and activation see the Activation Manual, which you can find along with the installer. a minimum of 2GB RAM memory. at least 50MB free space on your hard disk. a minimum screen resolution of 800x600 pixels. 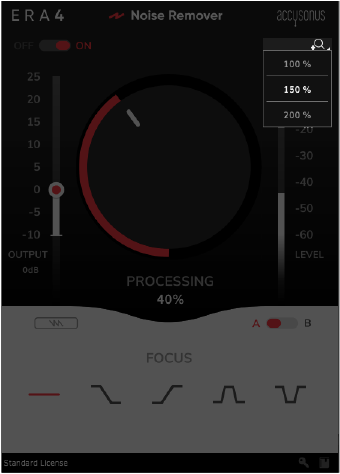 ERA Noise Remover supports the following sample rates: 44.1 kHz, 48 kHz, 88.2 kHz, 96 kHz. Warning: ERA Noise Remover is designed to be used as an audio effect plug-in inside Digital Audio Workstations or Non-Linear Editing systems. Only the plug-in formats listed above are supported. ERA Plosive Remover does not operate as a stand-alone application . Warning: There are just too many combinations of DAWs and plug-in formats out there, so there's always something we might have not tested. If you don't see your DAW above, you can always download the free, fully-functional 14-day trial and see if ERA Noiser Remover is supported for yourself. If you encounter any problems, let us know at support@accusonus.com . This is the main control of ERA Noise Remover. Most of the time you don't have to do anything else. Just dial in the amount of processing you want and you're done! 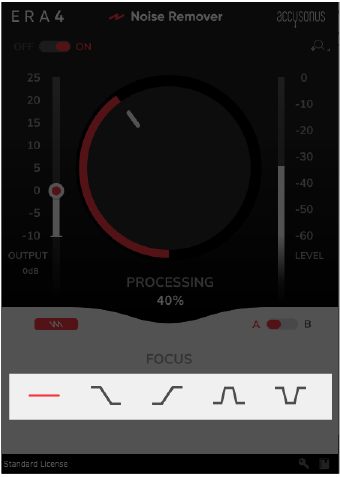 The knob values range from 0% to 100% and control the amount of processing applied to the audio signal. All-freq. focus: This option applies the same processing to the full frequency spectrum of the signal. Hi-freq. focus: This option focuses processing on the high-end range of the frequency spectrum of the signal. Low-freq. focus: This option focuses processing on the low-end range of the frequency spectrum of the signal. Hi/low-freq. focus: This option focuses processing more on the high and low-end range of the frequency spectrum of the signal and less to the mid range. Mid-freq. focus: This option focuses processing more on the mid-range of the frequency spectrum of the signal and less to the high and low-end range. Tip: These buttons are helpful when your audio is corrupted by noise sources that take up a specific part of the frequency spectrum. Example: Hiss, a common noise problem encountered in recordings with bad gain structure or low quality preamps, is usually concentrated in the higher frequencies. You can use the appropriate setting (in this case the "Hi-freq. focus") to tell ERA Noise Remover to apply most of the processing on those frequencies. This will reduce processing on other frequencies and leave your main signal as natural as possible. Due to the nature of noise suppression, the level of the output signal can be lower than the level of original, noisy one. 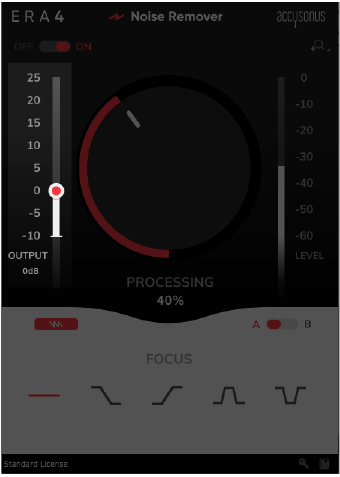 The output gain works as a make-up gain and allows you to adjust the level of the output signal. Note that this gain is also bypassed when the ON/OFF switch is set at OFF. This is very helpful when comparing the original and the processed signals. Tip: You can double-click on a control to reset it to its default value. There might come a time where you're not sure which setting is better. 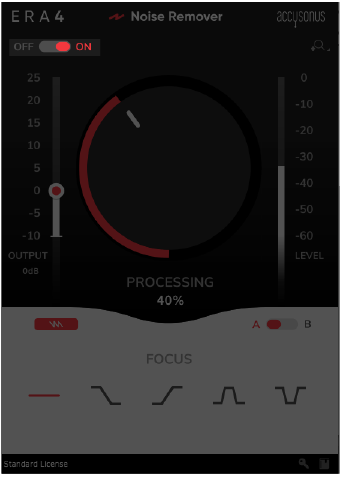 Note, that you can adjust the plug-in controls (Processing, Output Gain and Focus) independently for the A and the B setting. You can use the A/B switch to quickly compare two settings and help you in your decision. The ON/OFF switch allows you to turn on or off the plug-in processing. When the switch is at the OFF position, all processing is bypassed and the original signal comes through ERA Noise Remover untouched. Tip: We suggest to use the ON/OFF switch (instead of the DAW's bypass control for the plug-in). 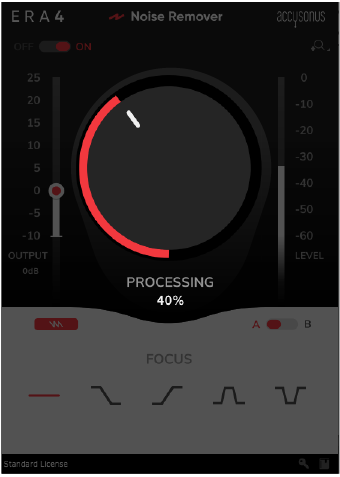 This will keep your audio in sync with the rest of your tracks in your DAW session. ERA Noise Remover offers the option to resize the plug-in window. This can be especially helpful if you have large or high-resolution screens or you just want to focus on a specific task. Click the zoom icon at the top right corner and choose between three settings. Use this form to contact our technical support team, if you haven't found an answer to your question in our FAQ section.